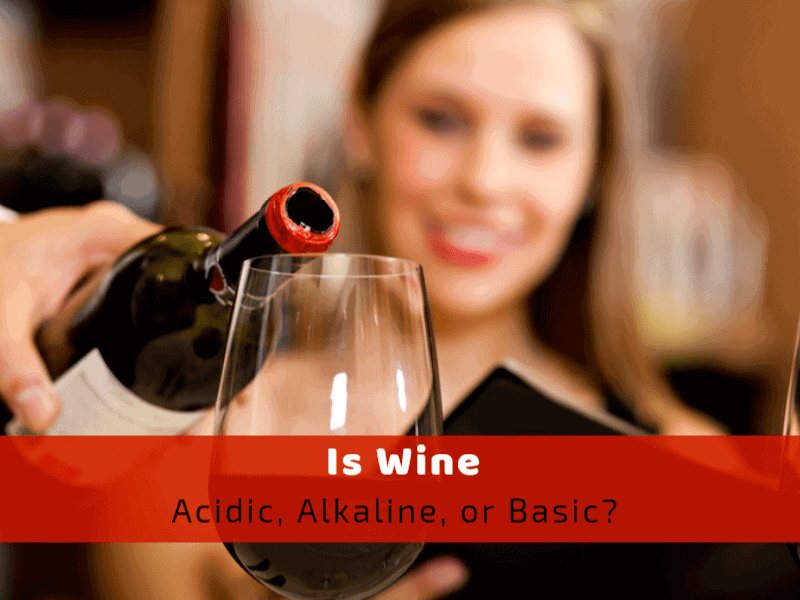 >> Is Wine Acidic, Alkaline, or Basic? Are you a wine lover? Have you ever thought why no two wines have the same taste? Is wine acidic, alkaline, or basic? Winemaking begins in cellars, basements, and garages. The process of creating wine is not like pre-made meals. It does not happen immediately. You need several components in order to be successful, as well as wine-making equipment and additives. You need the grapes of course, and the proper vessels (stainless steel tanks, oak barrels, jugs or plastic containers) to make and store the wine. You need wine additives and supplies like wine yeast, yeast nutrients, Campden (SO2) tablets, oak alternatives, and tanning products, depending on what kind of wine you will make. There are wine making kits available you can purchase it. You can buy a complete wine creating kit that will take you step-by-step through the entire vinification process. The main tree acids in the wines are tartaric, malic and citric. These acids appear naturally in the grapes but what do they contribute to? Is the wine you are going to make is acidic, alkaline of basic? What determines if the wine is acidic or alkaline or basic? Well before you begin with your winemaking process, it wise to get some more detail on how to get the right one by the time it comes to the table. Read through the article to understand the importance of testing the pH level of wine. And what contributes to making wine acidic, alkaline or basic. One of the most important tests in a winery is measuring the pH of wine. Let’s understand the importance of measuring the pH of wine accurately. You must be thinking what pH has to do with our current topic if the wine is acidic, alkaline or basic. We are giving importance to the measurement of the pH because – it is one agent that helps you to measure the acidity or alkalinity of a solution. The full form of pH is Positive Hydrogen ion, and the measurement scale is from 0 to 14. Till the measurement of 7 a solution is basic or neutral, but as the number gets higher, the more alkaline, the solution becomes. The acid level increases from 7 because an acid solution decreases. That’s all. Generally speaking, to any winemaker measuring the pH is a basic thing, because this is how they will get to know a lot about their wine. Depending upon the amount and strength of acids present, which one gets to know during the pH testing, the color, oxidation, chemical as well as biological stability is influenced. There are 3 main factors that decide the pH level of the wine, amount of acid present in total, the amount of potassium present and the ratio of malic acid to tartaric acid. If the presence of potassium is high, even though the wine has little acid, it will show high pH values. A win in which the malic acid is less and the titratable acid is more will have lower pH values. Why it is important to measure pH for wine? It is important to measure the pH level to know the stability of the wine. There is some microorganism that multiple easily in high pH, to control the growth, you need to know the pH level. Sulfur dioxide (SO2) acts as an anti-bacterial agent, and the growth of microorganism can be prevented by the accurate and consistent use of Sulfur Dioxide. What is the best pH level for wine? A pH level of 3.2 to 3.6 is the right range for good quality wine. The balancing needs to be done really well as anything lower than pH3.2 will weaken survival rates of both the malolactic bacteria as well as the yeast, while higher than pH3.6 will lead to harmful bacteria to flourish and therefore cause the wine the quality of the wine to deteriorate. Are pH and total acidity interconnected? Yes, there is a relationship between the pH and total acidity to some extent, but it is not that straightforward. The total amount of acid present in the wine can be determined by measuring the pH levels; you will get to know the total quantity of acid as well as the tartaric to malic acid ratio and the quantity of potassium in the wine. If the amount of acid is less and the amount of potassium is high, then the wine will have high pH level, and if the amount of tartaric acid is more and the malic acid, as well as the potassium, is less, then the wine will have lower pH levels. Wine is a mixture of acids, mainly tartaric, then malic, citric and lactic, and that’s why you cannot determine the acidity level of wine only with the pH levels. As because the tartaric acid is quite dominant the tartaric acid (TA) is also measured. The value of Tartaric acid ranges from 7-12 g/l. How can you adjust the pH and TA levels? The pH and Tartaric acid levels can be adjusted in a very convenient way. One can easily adjust levels; if you have to increase the acid, in red wines, you can add pre-purchased tartaric powder. For white wines, a mixture of one-third malic to two thirds tartaric for should go well. As because wine is a buffered solution it is difficult to get an exact pH level. Also, it is not easy to forecast how a g/l acid addition will adjust the pH. Most of the expert winemakers also struggle to get it right, and in the end, it is all your experience and the vineyard knowledge that contributes to making the finest wine. Note: Depending on the factors such as Flavor, Balance and Taste and the decision will be made on the ratio of pH and tartaric acid. Tartaric acid is one acid that is naturally present in grapes. It always stays in the wine, neither any microorganism nor any yeast consumes it during the winemaking process. By the process of cold stabilization, you can remove these small acid crystals, which are of the same size as the grains of sugar. If you don’t remove the crystals when the wine is cold, then they will again dissolve in the wine, they will be only visible again when the wine gets cold. A pH meter is the best way to measure the acidity level of wine during the winemaking process most accurately. You get that crisp, slightly tart taste of the wine due to the acids present in the wine. The amount of the acid will decide the quality and the taste of the wine, and that’s why you simply can’t go wrong with it. It is important that the acids are properly countered by the required ingredients in wine, to get that ‘in balance’ taste, which every winemaker desires to produce. Digital pH Meter: It is an electronic hand-holding pH meter that helps you to read the pH level and is quite user-friendly. These meters are highly accurate with great resolutions and some time available with a replaceable electrode. The equipment may require calibration solutions. Automatic pH Meter: There are a lot of automatic pH meters available in the market which allows automatic pH standardization at pH3 and pH7. The meters are smart enough to tell the users if they detect any dirt electrode so you can rest assured that you will get the most accurate reading almost every time. One of the essential traits of quality wine is its acidity. You cannot call it a great wine unless it has balanced it four basic traits- Acidity, alcohol percentage, tannin, and sweetness. Acidity is one of the important factors that enhances the quality of an aged wine. By now, you must have already realized the importance of measuring the pH level of the wine. Nobody wants to have a glass of wine that falls flat on your palate. Measuring the pH levels and the tartaric acid as well as controlling them to the recommended range will definitely give you the right blend. With time and your experience in winemaking will definitely get you going on the journey of winemaking.